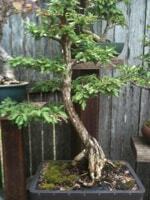 The Swamp or Bald Cypress is not a true Cypress but can make an impressive bonsai, especially if the material is of a good age, and has formed a powerful buttress and good character in the lower trunk. The feather-like leaves of this deciduous tree are long sprays of light green flat needles, that are also a great feature of this variety. Another feature is the light to dark brown flaky bark that forms giving the tree a premature aged look. Swamp cypress need the water kept up to them, and re-potting as soon as any signs of spring appear is best. They love to be pruned back hard, but you need to be diligent in removing un-wanted growth before it gets a chance to thicken, as they tend to swell quickly during their spring growth spurt. These trees will handle full sun although they prefer not to get direct sun in the middle of the day. A well lit spot that gets morning sun is best. As the name implies, (Swamp Cypress) these trees love to have their feet wet. During summer I keep mine in a shallow tray of water to keep it constantly moist. If let dry out, it will certainly let you know by drooping any new growth. Soak it thoroughly and it should recover if you have not left it dry for too long. Add some slow release fertilizer into the mix when re potting, after a month feed with fish emulsion or other organic fertilizer fortnightly throughout the growing season. Re-pot yearly as soon as the first signs of spring appear. I have only found small caterpillars nesting amongst the foliage, but that is about it for pests. Treat by manually removing and spray with pyrethrum, white oil or confidor.